Getting your home and family all ready for Christmas? Avoid having to take your dog to the vet on Christmas Day by following the best holiday safety tips for dog owners. We're even sharing some awesome holiday precautions that you may not have thought of! Love dogs? Want to do something to help abandoned animals and pet care facilities in your area? See what’s on the wish list at your local animal shelter. Avoid having to take your dog to the vet on Christmas Day by following these holiday safety tips for dog owners. There are some holiday precautions that you may not have thought of! 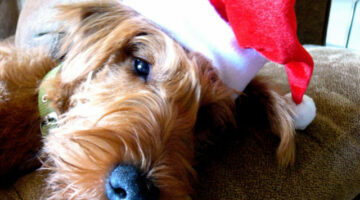 This video provides tips for keeping your dog safe during the holidays and winter months. Plus some specific holiday safety tips for dog owners and some winter dog hazards that you should be aware of. 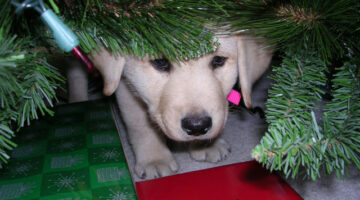 Having your family over this holiday season and not sure how to keep your dog safe? Here are some ideas. Plus some specific Thanksgiving day tips for dog owners. For example, do you know if dogs can eat turkey or not? If you’re a dog owner, then adding one or more of these resolutions to your own list of New Year’s resolutions will ensure a longer, happier life for you and your dog. What are your New Year’s resolutions this year? It’s up to you to keep your dog safe when Christmas decorations come out of storage, Christmas trees are put up, and and extra food is set out. Dogs love to explore, and all of these things can be a danger to your dog. Some can cause severe illness and may even be fatal to your dog. Here’s what you need to know. Check out this list of the best rock and roll music videos starring cute & cuddly dogs. If you haven’t already, I encourage you to program the phone number of an emergency care center in your cellphone now. You never know when you might need a little after-hours care or advice. 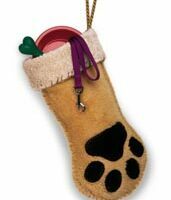 Here are some fun crafts that your dog — and dog lovers — will enjoy this Christmas. I found these white Labrador Retriever Christmas cards on the Breast Cancer Site… The Breast Cancer Site will fund 1 percent of a mammogram for each box of White Labrador Christmas Cards purchased. If you like White Labs, then these make fun and unique holiday cards for dog lovers. The Cutest Dog Christmas Cards! Here’s a funny — but true — look at what makes someone a dog person… How many of these things do YOU do??? Any dog — or dog lover — will enjoy these completely personalized doggie gift baskets. You say exactly what you what in it, and that special someone — and their dog — will thank you for such a thoughtful gift! 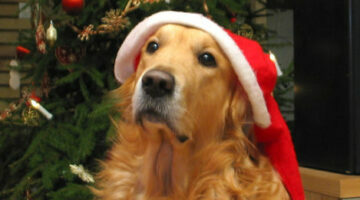 Check out these Santa hats and other pet costumes for your dog this Holiday season. Christmas hats and collars like: reindeer ears, joker collars, Santa costumes, elf costumes, jingle bell collars and holiday bow-ties. At our house, it seems like each and every year the act of wrapping gifts turns into a huge ordeal. Mostly because we’ve got two dogs who tend to make their way into the process. 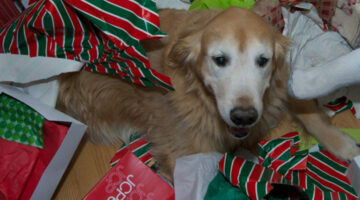 Here’s a humorous take on wrapping presents when your pet is in the room.